1. The high pressure PU foam machine adopts measure pump, so this machine has slow speed and high precision. Even if the temperature is changing, pressure and viscosity will not change then mixed proportion. 2. This steel construction machine has many advantages, especially having advanced pour point structure and others are reliable performance, convenient operation, and easy maintenance. With these advantages, this kind of high pressure polyurethane foam machine can be moved in the direction of front, back, left, right upper and below. 3. 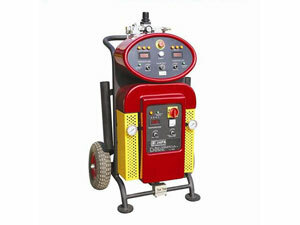 This machinery is also equipped with PLC to improve its automatic ability. This high pressure polyurethane foam machine is used to produce horniness and semi-horniness, such as instrument plate, cold locker, active cold storage board, etc. 8) Hydraulic station: hydraulic tank 20L, integrated with over-flow valve, safety valve, pressure gauge, discharge valve, electromagnetic valve, anti-shock pressure gauge, etc. 9) High pressure mixing head: developed by ourselves, high precision, hydraulic control, L type, self-clean, solvent free, life is more than 300 thousand times (if more than 300 thousand times, this head can be repaired and used again); Outer diameter of the nozzle: 24mm. 10) Temperature control system for tanks: the two tanks are heated by waters in the interlayer of the tanks; Equipped with two 2kW heaters; Electronic numeric displayer temperature controller is equipped to keep invariable temperature needed for glues. 11) Pressure pipes are chosen from Chinese domestic qualified supplier. 12) Auto-filling devices for two tanks: two self-absorbing pumps, motor power 1.5kW each. 14) PLC automatic control: PLC programmable; Special PLC system from Chinese domestic which can save 99 programs. 15) Equipped piston type counting pump: adjusting accuracy 0.05%. 17) Suspending arm length 2.5m, rotated in 270°, horizontal injecting or vertical injecting. Yingkou Changsheng Steel Structure Project Co.Ltd is a professional manufacturer and supplier of PU foam machine in China. Apart from low pressure polyurethane foam machine and high pressure polyurethane foam machine, we also offer EPS - rock wool sandwich panel machine like C purlin roll forming machine, Z purlin roll forming machine etc; auxiliary equipment products like automatic tube bending machine, plate bending machine etc; k-span machine, like automatic building machine, ultimate building machine and arch style buildings forming machine. With good quality and affordable price, the products produced by our company has exported Germany, Holland, India, Indonesia, New Zealand, Syria, United Arab Emirates, Russia, Kuwait, South Africa, and Bangladesh. If you are interested in our products, please contact us for details.